Finally, someone has made the perfect protein bar. Perfect taste, perfect texture, perfect nutrition, perfectly satisfied! Think Thin bar's are DELICIOUS. 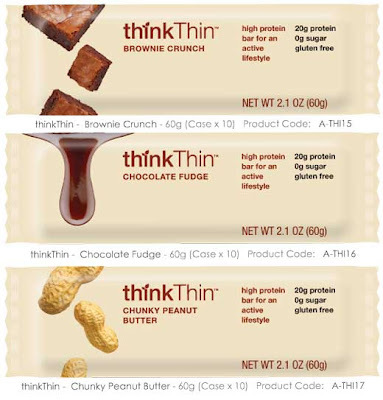 Think Thin bars are absolutely delicious. Absolutely Yummy. Think YUM. Think Healthy too: sugar free, gluten free & sugar free. What else could you want? Great for an 'on the go' breakfast, lunch, dinner or snack. Your mouth will thank you. You might even get a thank you card for being so thoughtful. Call me skinny, but think thin...k? chunky peanuter butter is my fav. I love the premise of your blog! Trader Joes is my favorite! ((they have a new dip in the hummus section with lentils or something purplish of some sort if you're looking for a new item)) have you tried their goat cheese medallions or fat free feta? Thanks for the support! I have not tried either, but I will definitely give them a try. I will be shopping later tonight! Are they Milk free? My friend would love them if they are! Excellent low sugar choice without unhealthy artificial sweetness! Wish Trader Joes offered more items like this.